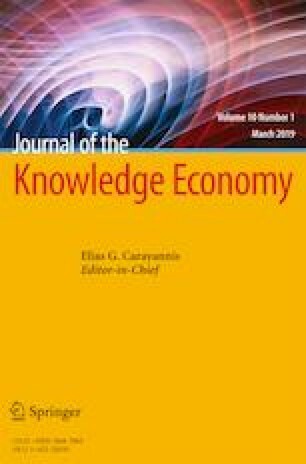 The purpose of this study is to explain differing innovative behaviours in Spanish high and medium technology firms according to the investment made in knowledge management practices within their innovation processes and their investment in their workers’ capacities. Using a methodology of clusters, four separate types of behaviour were identified for their innovation performance. The cause and effect relationships between the defined constructs were studied by applying SEM methodology in each cluster identified, as well as the direct impact of the knowledge management constructs on the innovation performance construct. In all cases, knowledge workers have the greatest impact on innovation performance. There is also a strong correlation between knowledge workers and investment in internal knowledge management. Finally, the factors that hinder innovation activities are determined by the size of the companies. Further theoretical and empirical development will be required to provide comparison and feedback on the findings found over time and with a more inter-sectoral and intra-business focus. Organisations interested in improving both their innovative activity and their knowledge management, must be aware of the importance of knowledge workers, (key for internal R&D knowledge) and of the need for continuous training as the main tool for stimulating the continuous transmission and generation of knowledge. This is a new contribution to the patterns of behaviour with regard to innovation performance, complementing other sector studies carried out in Spain and elsewhere, and gives further proof of the positive effect of innovation knowledge management.